I’m going to post several photos, over the next few days, from the wonderful Glasgow Science Centre. 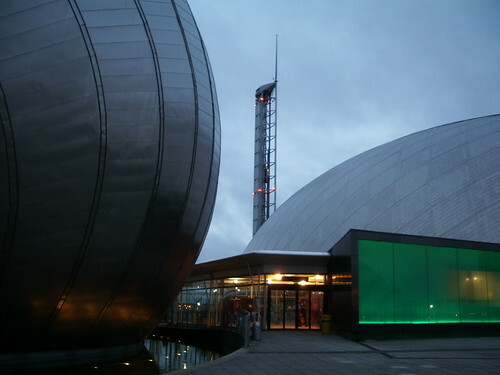 The Science Centre is in fact one of three linked attractions – in this picture it is the smaller dome on the right with the square green window which is in fact a series of lights changing colours, so it could be green, blue, purple, yellow, all sorts. Also in the picture you can see the Glasgow Tower (more of this architectural marvel tomorrow) and on the left is the IMAX cinema. It’s not the cheapest family day out, but it really is worth the money for loads of things that would engage kids of all ages (if you know what I mean – we were just like big kids in there!). This entry was posted on February 11, 2008 at 12:01 am	and is filed under Uncategorized. You can follow any responses to this entry through the RSS 2.0 feed. Both comments and pings are currently closed. I will look forward to more photos of this unique building and the science center. Thanks for visiting my blog and just like you wan to visit the part of the world I live in I’d love to visit Glasgow. For sure Glasgow is on my NEED to visit list. IMAX is always intriguing to the young at heart. As is a science center. I think science reminds us of our dreams as a child.